It was a beautiful Saturday morning in Charlotte, NC and I awoke feeling refreshed and blessed in so many ways. Mami2Mommy was invited to see The Magic Kite – El Papalote Magico at the Children’s Theatre and so I took my daughter, my sister and nephew to see the show. When I first heard about this show I was excited to see it because it resonated with me on so many levels. This beautifully written story is about a boy named, Tito, whose father is unexpectedly deported to Mexico. With the use of puppets and live music this magical story is told with a performance that is seamless and connects with children and your heartstrings. Over the years I have had several conversations with my children about my childhood and how very different it was from theirs. I grew up in a small Hudson River town in New York with my family. We by no means were rich but my parents worked hard and gave us everything we needed. We were a Latino family from Peru growing up in a town that never treated us differently. To this day we still have strong ties to our hometown and friendships that have lasted a lifetime. As we drove to the Children’s Theatre my sister, Jennifer, and I began to talk with our children about the show we were about to see. My daughter and nephew began asking us questions about deportation and why would a family member be sent away for no reason. My sister and I looked at each other and there in that moment a dialogue began and we shared with them our family story. Without his family, my Papi traveled to New York from Peru to give us a better life of opportunities. At that time it was my mama, my sister and I. My sister and I were very young and only one year apart in age. I can tell you with certainty that I have no memory of my Papi leaving us, but my mama shared stories of how much we missed him and how difficult it was for all of us. After about a year my mama, sister, and I headed to New York to join my Papi and to begin our lives together in a new country. There were many challenges for us when we arrived. We knew no one, we had no family there and a language barrier made it even more difficult. Over time we assimilated, began attending public schools, made friends and learned to speak English. We were making a life for ourselves in our new home in America. My mama even had another a child, a baby girl. But then one day something changed – something was very different. My parents told us we had to pack up and go back to Peru and my sisters and I didn’t know why. After a few months of living in Peru, I worried whether we would ever return? Thankfully we were able to go back home. Yes, I say home because America was and is my home. Without getting into all the details of what happened during that time, the story of the Magic Kite brought forth memories of how I felt when I was young – confused, afraid and unsure of what was to be for our future. But over time I realized that we were going to be okay and that my family would stay together. The love and unity of family made me the strong person I am today. My parents taught me to work hard and believe in myself. Because of them I am an educator, a blogger, a mother, a wife – I am Peruana. As I watched the show and got lost in all it’s beauty in the colors, music and language it made me teary eyed because it reminded me of what my own family went through. It also reminded me of the sacrifices my parents made by leaving everything and everyone that they knew and loved behind. My siblings and I didn’t get a chance to grow up with abuelitos (grandparents), primos y primas (cousins), tios y tias (uncles and aunts) but I wouldn’t change a thing in my life. Facing adversity made me a stronger person. This show demonstrated in a kid-friendly way that everything will be okay even when you are the most afraid. 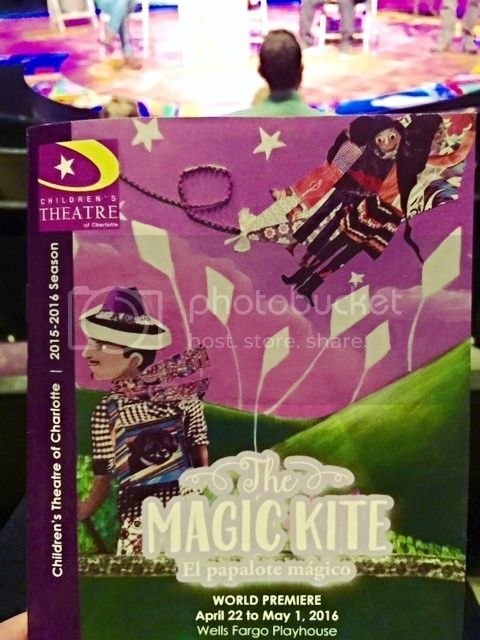 My favorite part of the show was when Tito chanted “Sube, Sube Magic Kite – Papalote to the Sky” and up, up, up, and away he flew on his magic kite that he and his father made together – priceless! Thank you to the Children’s Theater of Charlotte, Jose Cruz Gonzalez – writer, Adam Burke – Director, Rosalia Torres-Weiner – artist, and all the performers for telling this story in a way that many families can connect with. The Magic Kite – El Papalote Magico will be showing from April 22 – May 1. There are still tickets available here. Now to get you you even more excited about this show we want to set up (1) lucky reader with a (2) pack ticket voucher to see The Magic Kite at the Children’s Theatre. Winner has a choice of show date & time (with the exception of sold out shows). Daphne is a Co-Owner of Mami2Mommy.com and the North Carolina Editor. Born and raised in New York she has fully embraced - with her husband of 13 years and her two wonderful children Brandon, 9 years old and Amelia Rose, 5 years old - all that the Carolinas have to offer...which is a lot! Follow her on Twitter @Mami2MommyNC and on Facebook.com/Mami2MommyNC. « 10 Easy Ways to Save the Planet Gardening! Harlem Globetrotters #Charlotte Promo Code – Hurry Ends March 16th & Coloring Page! It’s really hard to pick a favorite family memory. I would have to say, a favorite with my daughter would be riding the big Ferris wheel at the beach. I was terrified and she had a blast. So fun to see her experiencing new things.